This Fast Print sign advertises a printing services business near my apartment, though the sign itself doesn’t inspire much confidence. It looks as though it might date back to the introduction of the Xerox (which was 1959). 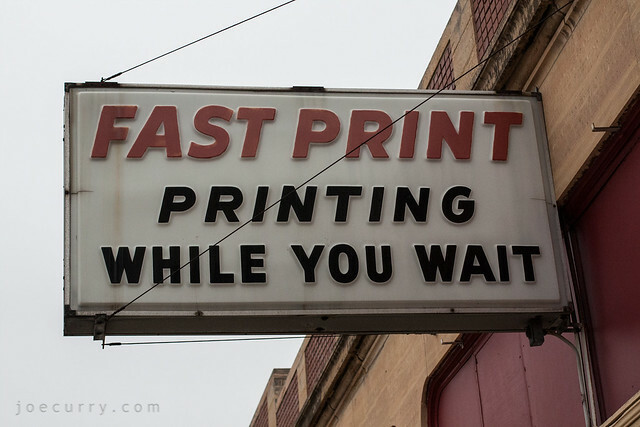 With a Sir Speedy branch literally across the street (and its speedy looking logo), I often wonder how “Fast Print” can possibly run a swift business of customers. At least no one uses the Ditto machine anymore. I actually remember getting those bluish-purple copies in elementary school, fresh from the machine. Anyone else? This entry was posted in General by Joe Curry. Bookmark the permalink.